Bhavani and Kumar were aiming for financial independence. But they didn’t know at what amount that will be, and when. Also, they had not considered the risks that could derail their plans. “I was always interested in finance. I knew about investments, but not risks. Also, we didn’t know how much risk we could take, how much had to be invested, and where,” said Kumar. He came to know of a group on Facebook, which he signed up with. The group had organised an offline presentation with a few fee-only planners. Kumar attended this event, where he met Piyush Khatri, who later became the couple’s financial planner. 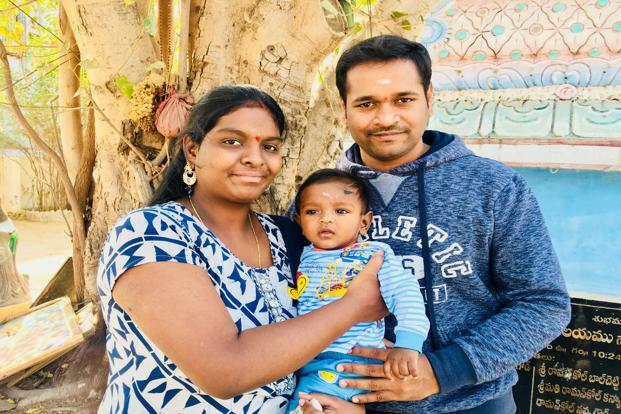 Bhavani was busy taking care of their now 6-month-old baby boy, Bhanu Advith, so she was not able to go for the initial meetings with their planner. “Also, I was not that interested,” she said. But their planner insisted that she be fully involved as the decisions will have to be taken together and would affect the whole family. So Bhavani participated in these meetings through video calls. The couple had not thought much about their goals, apart from financial independence. “We started thinking of what our goals would be, and we put them down on paper,” said Kumar. They felt they needed a house, a car, and had to plan for their son’s education needs. This is when the question of insurance came up. “Piyush explained how important insurance was. I don’t understand financial matters, but I understood this,” said Bhavani. Gathering details of expenses threw up some surprises. “There was so much I didn’t know. We had not anticipated how much some things could cost. When our son was born, we thought the extra expenses would be maybe Rs3,000-4,000. But it was actually much more,” he said. One of their near-term aims was to buy a car, within 6 months. “Since this (goal) was very close, we continued to keep the money in fixed deposits. And we bought the car without a loan,” said Kumar. Among the first steps in the plan was to enhance Bhavani’s and Kumar’s life insurance. Also, his term plan was with riders. These have now been removed, and there is a separate cover for those risks. They now have accident insurance, and their own health cover. “Earlier, I used to think that what the company gives is enough. But Piyush explained that if I were to quit my job, things will be different. Now, we are young and healthy, and will get cover easily,” said Kumar. For emergency funds, the couple’s money is in fixed deposits and liquid funds. In terms of investments, Kumar was wary of stock markets, which meant his exposure to mutual funds was too little. Based on their goals, their portfolio was modified. “It became diversified. He suggested some equity large-cap funds, and some mid- and small-cap funds, keeping our (young) age in mind,” said Kumar. Bhavani and Kumar have had to adjust their goal of buying a house. “I don’t want a big (home) loan, so I have not bought a house yet,” he said. Based on current prices and future prices, they had thought of investing an amount. “But we realised this was too less. So, we could either postpone the purchase or increase the amount. We made our expectations realistic,” said Kumar. For all their goals such as son’s education, buying a house and achieving financial independence, the investments are now in different types of mutual funds through SIPs. While it has been only about 6 months since Bhavani and Kumar started on their financial plan, a review is due soon to take into account the changes they had to make. “There are many things to do initially—insurances to buy and SIPs to start—so it takes some time. Piyush helped us a lot with that,” said Kumar. The couple is more confident now about their finances, and has a trustworthy sounding board. Bhavani, too, is fully aware of the investment details.